Nigeria football legend Stephen Keshi has died suddenly at the age of 54. One of African football's best-known figures, the ex-Super Eagles captain is one of only two men to win the Africa Cup of Nations as a player and a coach. NFF president Amaju Pinnick: "This is devastating. We have lost a superhero." 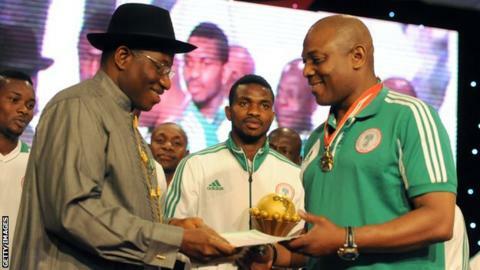 Keshi, who is reported to have suffered a heart attack by local media. also managed Togo and Mali, while his playing career included a spell with Belgian club side Anderlecht. Sunday Oliseh, a former team-mate and Keshi's successor as Nigeria coach, tweeted his shock at the "horrible news" and called Keshi "an iconic hero". Other tributes are being paid from around the world. Keshi skippered the Nigeria team that won the Nations Cup in 1994 before narrowly missing out on a World Cup quarter-final place the same year. He coached the Super Eagles on three occasions, leading them to the 2013 Nations Cup title in South Africa and the last 16 at the 2014 World Cup. His contract was not renewed after the Brazil tournament but he returned on a match-by-match deal following the team's failure to reach the 2015 Nations Cup finals. He was then sacked as caretaker coach but reinstated after intervention from then Nigeria president Goodluck Jonathan. Keshi, who lost his wife to cancer late last year, was then sacked for a final time last July.